It's that time of the month again and my Violet Box (A$22.95/month) has finally arrived! Much to my surprise, when I opened my Violet Box I was sadly left a tad underwhelmed. The thing about beauty subscription boxes is that they can be either fabulous, mediocre or just completely off my interests. My disappointment was primarily due to the fact that there were no eye, cheek nor lip products (my favourite categories!). However, I did end up developing a liking for this box because the products included were entirely new to me and I was quite keen to take them for a test-drive! 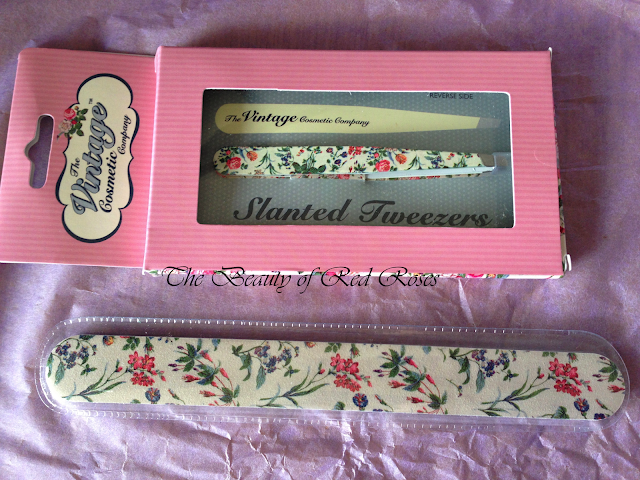 The Vintage Cosmetic Company Floral Slanted Tweezers (A$14.95, full size) and Emery Board (A$4.95, full size) were the stand-out products as I absolutely adore the gorgeous floral design of these beauty tools! It was a really nice surprise to receive these products, because they are from the UK and they do look cute sitting on my dressing table! The stainless steel slanted tweezers are well made and I was able to pluck my eyebrows finely and accurately with ease. The surface of this emery board isn't too harsh on the nails, which is a great thing, so this cutie will stay in my handbag for emergencies. 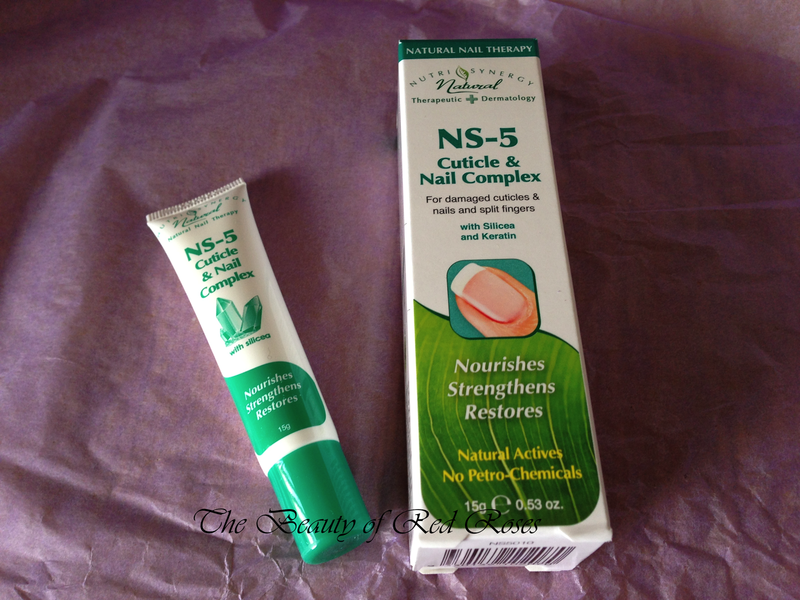 NS-5 Cuticle & Nail Complex (A$9.95/15g, full size received) is an Australian-made product that is formulated using natural emollients which helps to moisturise and treat damaged cuticles and nails. The slightly thick white opaque formula contains Silicea, Keratin, Shea Butter, Aloe Vera, and Vitamins E and B5 to help strengthen, restore, moisturise and protect the nails. Although the formula was quite thick in consistency, I found that the cream was fast-absorbing and didn't leave any distinct scents. Sinful Nail Polish (A$4.95/15ml, full size received) is made in the USA and the shade I received (out of a possible 5 that were distributed by Violet Box) is called 'Gogo Girl'- a fire-engine red. The consistency is relatively thin, however, the pigmentation was pretty good. I applied two coats to achieve an opaque and glossy finish. The shade I received is quite dupable and I do actually have a few similar shades in my stash. 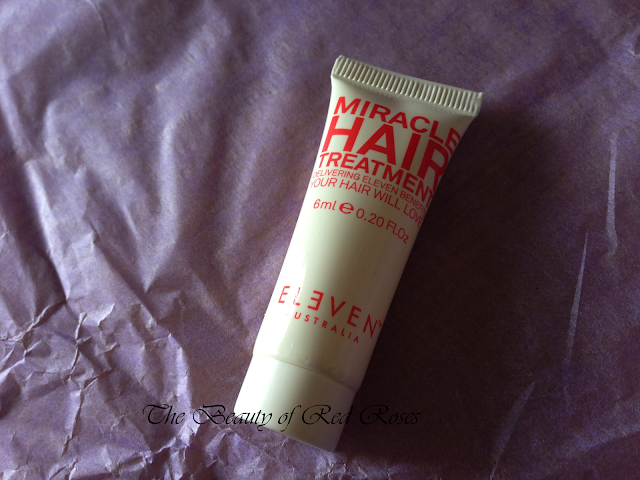 Eleven Australia Miracle Hair Treatment (A$24.95/125ml, 6ml sample received) is a lightweight silky formula which delivers 11 benefits to hair. Just simply apply directly onto damp hair for healthier and nourished hair. I was able to get two uses from this hair serum and it did leave my looking softer and well hydrated. The scent of this formula reminds me of cocoa butter, which smells quite lovely, though the scent does disappear after a short while. 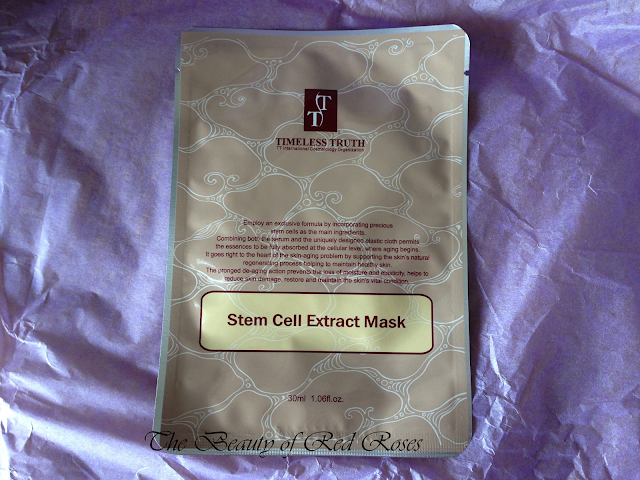 Timeless Truth Stem Cell Extract Mask (A$5/mask) helps to reduce the appearance of fine lines, wrinkles and dark spots. The cloth is made in Japan and contains Criste Marine Stem Cell Extract (repair and protect), Idebenone (skin rejuvenation), Palmitoyl Pentapiptide-3 (stimulates collagen production) and Vitamin A (antioxidant and moisturising ingredient). The very moist, soft and lightweight cloth was a delight to use and my skin felt incredibly relaxed and revitalised. What do you think of the contents in this month's box? *Products were provided for consideration only. These reviews are 100% based on my own thoughts and opinions. I am not affiliated with Violet Box and did not receive remuneration to post these product reviews.